B1B95 code - While the CAN bus ignition status is in IGN RUN and the module is configured for a seat track position sensor, the module checks the sensor input current ranges. This DTC may set when the module detects that the sensor input current is below 1 mA. With the scan tool, read Occupant Restraint Controller (ORC) DTCs. Does the scan tool display any active DTCs relating to internal faults, ignition faults, or battery faults? Yes, diagnose and repair the DTCs. Refer to the table of contents in this section for a complete list of diagnostic procedures. Does the scan tool display active: B1B95 code? No, perform the Airbag intermittent. Turn the ignition off disconnect the 12 volt battery and wait two minutes. Using the wiring diagram as a guide, inspect the passanger seat harness wiring and connector. Look for chafed, pierched, pinched, or partially broken wires and broken, bent, pushed out, spread, corroded, or contaminated terminals. Are any of these conditions present? Yes, do not attempt to repair the seat harness. Replace the seat harness if any of these conditions exist. Replace the passanger seat harness. Verify that the passanger seat harness is routed correctly. Is the passanger seat harness routed correctly? No, reroute the passanger seat harness as necessary. Disconnect the ORC harness connectors. 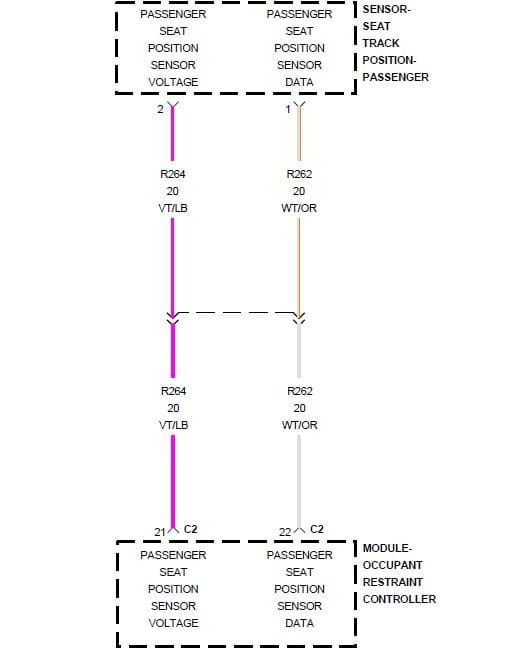 Measure the resistance of the passanger seat position sensor data circuit between the aproppriate terminal ORC harness connector. 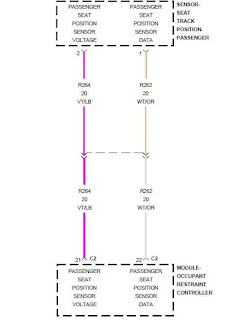 Measure the resistance of the passanger seat position sensor voltage circuit between the ORC harness connector. Is the resistance of either circuit above 5.0 Ohms? Yes, replace the Passanger seat harness. Replace the passanger seat track position sensor. Reconnect the vehicle body harness to the seat track position sensor. Remove any special tools or jumper wires and reconnect all previously disconnected components - except the battery. Connect the scan tool to the DLC use the most current software available. Use the scan tool and erase the stored codes in all airbag system modules. Turn the ignition off, and wait 15 seconds before turning the ignition on. Wait one minutes, and read active codes and if there are none present read the stored codes. Did the active passanger seat track position sensor DTC return? Yes, if the Occupant Restraint Controller (ORC) is dropped at any time, it must be replaced. Replace the Occupant Restraint Controller (ORC). 0 Response to "B1B95 Passanger Seat Track Position Sensor Circuit Open"